It all began four or five years ago when Bill Payden started picking up stray cans and bottles during his fitness runs past Moline’s Wharton Field House and Browning Field. He’d take the containers home, where he and his wife, Lisa, would rinse and then take them to a recycling drop-off bin. For them, recycling simply made sense as responsible citizens. And “we don’t like to see trash on the ground,” she says. Random containers grew to bags-full, and the endeavor ratcheted to a new level about three years ago when Payden, a retired Moline firefighter, happened by the field house after high school graduation and saw how many receptacles had been left behind. 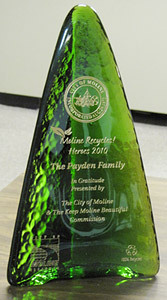 The Commission would like to thank the Paydens for their work keeping our city clean, and encourage others to follow in their example.